I recently had the opportunity to participate in a multi-part series of educational presentations titled Women, War and Change. One session was devoted to Olive Gilbreath, born in 1883 in La Plata, Missouri, population 1500. Her father was well-to-do, so Olive received a good education, but could not find satisfaction as a teacher in the Midwest. Instead she set off, by herself, to be a journalist covering the Russian revolution of 1917. She rode a train across Siberia in the company of Russian soldiers. In Petrograd she saw first-hand the growing revolution and the final days of the glittering aristocratic life of Imperial Russia. She wrote a fictionalized account of her experiences titled Miss Amerikanka, which was published in 1918. It is now out of print but available through used book sources. Olive’s prose is florid, rococo, very Victorian, but her book has great charm and vividly recalls a time and place lost to history. Perhaps equally fascinating is the rest of Olive’s life. 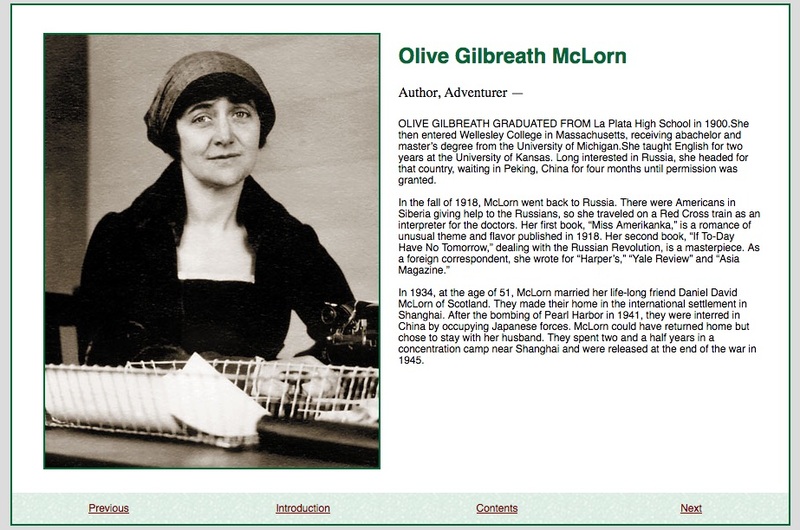 She married David McLorn, a British citizen working in banking in China, and lived in Shanghai with him for twenty years, through Mao Zedong’s Cultural revolution and the Japanese invasion. And at the end of these many adventures, at the end of many years spent living in foreign cultures, she and her husband came back to sleepy La Plata, Missouri and lived out the rest of their lives there in relative obscurity.